This week a group of us will is attending the IEEE Electrical Safety Workshop in Louisville, Ky (can't wait for a Hot Brown! ), and I am excited about all the awesome presentations on electrical safety. It's kind of our thing, as you know, and it is always a great experience to be around others who have a passion for electrical safety. One of the presentations yesterday was about electrical safety was about the history of OSHA codes, where they are now and where they are going. I didn't get to ask my question to the presenter, so I am going to ask you all. The presenter was a long-time OSHA code writer and he indicated that the consensus standards are more up-to-date than OSHA standards (I think his exact words were with OSHA it is more like looking in a rear-view mirror). It is also widely understood that OSHA standards are the bare minimum of what is needed to be electrically safe. So, here's my question: If OSHA is so far behind the consensus standards and if OSHA is just the bare minimum on what should be required to be safe, why doesn't OSHA just adopt the consensus standards and regulate from them instead? We discussed this qustion at dinner last night and I'm curious about your thoughts on it. Please share your them with me by using the comment section! Let's have a hearty discussion! The grandpa has a pretty good voice, but the grandma...oy. What she lacks in musical ability she MORE than makes up for in pure humor. Raw talent, I say, nothing but raw talent! I hope that brought smiles to your faces! A reader by the name of Bob reminded me about National Create a GracePort® Day, which we named about two years ago, and I thought we would resurrect it. Many of you know about our Find-a-Graceport® tool, which has our most common GracePorts®. What you won't see are many of the custom ports we do on a daily basis. We have more than 13,000 part numbers and we add to that on a daily basis because of our unique ability to put any connection with any outlet, and add special text and logos. Grace Engineered Products can not only create your simple, everyday GracePort®, but we can just as easily do the complex, hard-to-find GracePorts®. 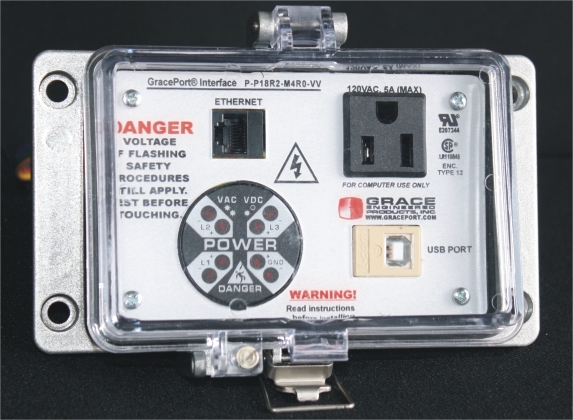 Please think of us when you need a port for the outside of your panel!